Victor Bertrandias was born on May 14, 1894, in San Francisco, California. He learned to fly in 1915, and enlisted in the U.S. Army on May 21, 1917. Bertrandias was commissioned a 2d Lt in the Aviation Section of the U.S. Army Signal Corps on May 14, 1918, and during World War I he served as Chief of Maintenance for the 94th Pursuit Squadron in France. Lt Bertrandias served with the Army of Occupation in Coblenz, Germany, from 1920 to 1921, and then served as an engineering officer at Mitchel Field, New York, and Langley Field, Virginia, from 1922 to 1924. 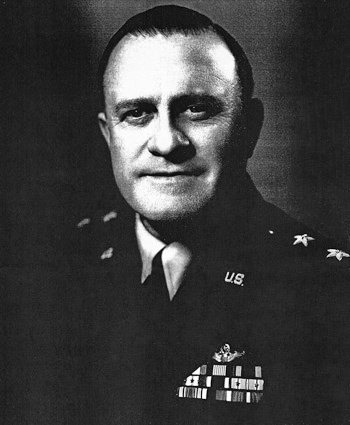 His next assignment was as chief inspector of the Engineering Division at McCook Field, Ohio, from 1924 to 1926, followed by service as Western District Manager for the Army Air Corps, where he was in charge of all procurement and test flight experimental work from 1926 until he left active duty and joined the U.S. Army Reserve on September 17, 1929. Over the next 13 years, he worked for Fokker Aircraft and Douglas Aircraft. Gen Bertrandias was recalled to active duty on July 31, 1942, and served with Headquarters 5th Air Force in the Southwest Pacific Area from August 1942 to November 1944, serving as Commanding General of the Far East Air Service Command from December 1942 to November 1944. His next assignment was as chief of the Maintenance Division of the Air Technical Service Command at Wright Field, Ohio, from December 1944 to July 1945, followed by service as Commanding General for 8th Air Force Service Command on Okinawa from August to September 1945. Gen Bertrandias next served as advance officer for the 5th Air Force occupation forces in Japan before returning to the U.S. in late September 1945, and leaving active duty on January 21, 1946. He served in the Air Force Reserve and worked for Douglas Aircraft from January 1946 to September 8, 1949, when he returned to active duty as advisor to the special assistant to the Chief of Staff of the U.S. Air Force for Reserve Forces. Gen Bertrandias served in this position until February 1950, when he became Director of Flight Safety Research in the Office of the Inspector General at Norton AFB, California. He then served as Deputy Inspector General for Technical lInspection and Flight Safety Research from September 1950 to January 1952, followed by service as Deputy Inspector General from February 1952 until his retirement from the Air Force on February 28, 1955. During World War II, Gen Bertrandias was credited with destroying 1 enemy fighter while flying in a gunner position on a B-24 Liberator bomber in 1943. Victor Bertrandias died on March 18, 1961, and was buried at Arlington National Cemetery. For heroism on 31 July 1945 while participating in aerial flight from Mather Field, California to Okinawa. A member of the crew accidentally discharged a Very rocket pistol within the cockpit of the B-17G type aircraft and the rocket ricocheted from the pilot's compartment to the navigator's compartment below. Major General BERTRANDIAS, with complete disregard for his personal safety, dove from the co-pilot's seat into the navigator's compartment, called for a fire extinguisher and in the meantime beat at the burning rocket flare with a map which had been on his lap. He pushed the still burning rocket through the bottom of the compartment and it fell in two pieces to the ocean below. By localizing the signal flare, he prevented spread of the fire and further damage to the aircraft. Oxygen bottles and gasoline lines were within inches of the burning rocket. Major General BERTRANDIAS injured his knee and groin in the act. Once the fire had been extinguished and a careful check made of the airplane, he ordered the flight to continue. Major General BERTRANIAS' quick thinking and prompt action undoubtedly saved the aircraft and all aboard from instantaneous death from explosion. His courage and heroism are in the highest traditions of the military service.